Each accommodation has a private terrace, a fully equipped kitchen (fridge, induction hob, microwave, crockery), a shower room, and an additional shower in the 3 bedroomed cottages. TV as an option. High speed Wi-fi connection. Everything has been designed for your comfort, whether you are on your own, in a couple, with family or with friends. 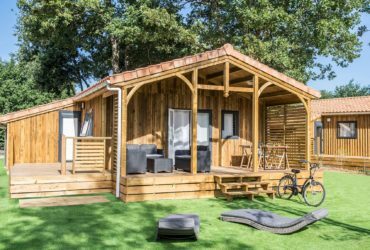 The Confort/Mimosa Chalet with its two bedrooms, a surface area of 35m2 and covered terrace is the perfect place for couples with or without children. All the other accommodation, the Confort cottage, the two and three bedroom Privilège cottages, with one or two bathrooms, and the VIP chalet can sleep up to 6 people. 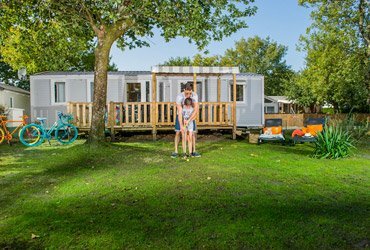 This range of accommodation, which offer you variations to best meet your expectations, are ideal holiday rentals for families with children or friends. 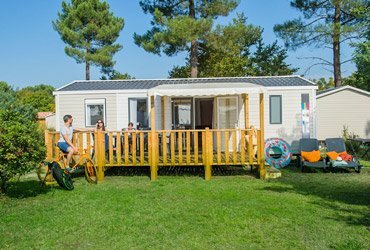 You like the friendliness and contact with nature that a camping holiday offers, but you would like to keep your daily comfort during your holidays in the Arcachon basin? 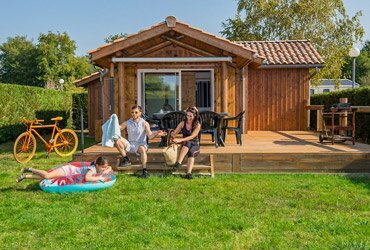 The 4-star La Forge open-air hotel in La Teste-de-Buch offers modern and fully equipped mobile homes and prestige chalets. Installed on a vast plot separated from the other grounds by natural hedges, they are aimed at visitors in search of luxury who are looking for an upscale accommodation to feel like home on their vacation spot. 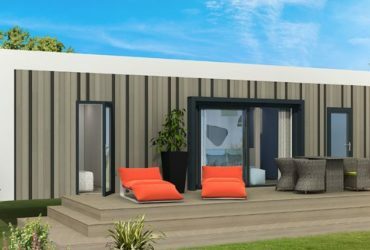 Our mobile homes will surprise you with their modern design, compactness and aesthetics. You will inherit a turnkey rental with several living areas: living room with convertible sofa, kitchenette with dishes and equipment (induction hob, fridge, freezer, microwave, coffee maker, kettle), 2 or 3 bright rooms including a master with double bed (pillows and duvets provided), bathroom and separate WC. And so that you can share your meals and relax after your visits in the Gironde in your private garden, each rental has an outdoor terrace with its table and chairs. Our premium accommodations like the cottage and the VIP cottage also include a toaster, TV, Wi-Fi, BBQ and lounge chairs. Because our vacationers have a different budget and needs, we have taken care to select several ranges and sizes of rental. 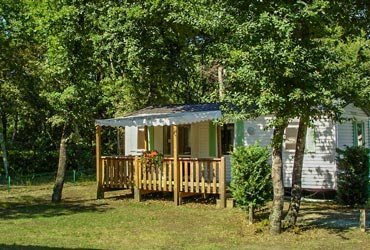 Families with two children, couples of friends and small groups of four who want to save money will turn to a cottage or chalet comfort of 34 or 35 m2. Large families and groups of 5 or 6 people who place luxury at the center of their stay will prefer our beautiful VIP chalet (2 rooms) or our Privilege cottage (3 rooms). Unless you let yourself be seduced by the fabulous design of the VIP cottage (4 people, 36 m2). 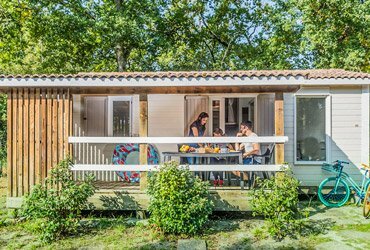 If you think that comfort is a question of surface, think again: the quality of a stay in mobile home in Gironde is actually a matter of planning. By crossing the door of your mobile residence, you will be surprised to find that it contains several independent rooms on an area of ​​34 or 36 m2. You can cook peacefully while your children or friends are showering, napping or watching TV. In the end, you will have in the Arcachon basin the same intimacy as in your usual home, in a slightly smaller space. Take advantage of this feature of your fully equipped accommodation to reconnect with members of your tribe! Each living room of our mobile homes and cottages have their charm. That said, one of them prevails over others during the beautiful days: the private terrace overlooking your shady ground and the tree lined paths of the campsite. Equipped with a garden furniture, it will become your meeting place at the time of the aperitif and meals. 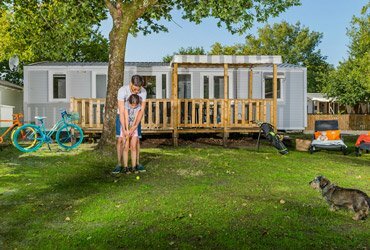 If you book a high-end accommodation in the area of ​​La Forge in the Gironde, you will find on your terrace a barbecue to cook your seafood and vegetables a la plancha, as well as sunbathing to give you a nap deserved after your swimming lengths in the pool, your tennis match or your petanque tournament.